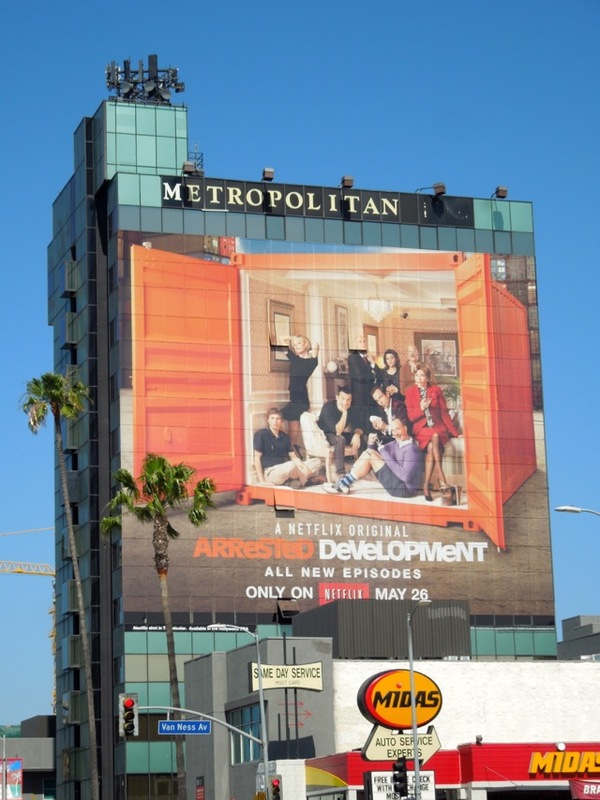 Netflix have seen some success and positive buzz with their original programming initiatives, House of Cards and Hemlock Grove, but now it's time for them to test an established television property by bringing back Arrested Development for a fourth all-new season. 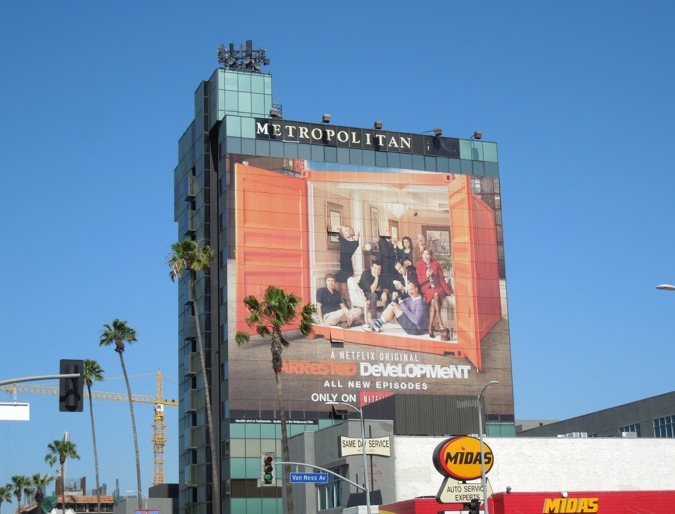 Not only that, but you'll be able to get all fifteen of the season four episodes all at once for a marathon binge-streaming session, rather than the usual weeks of waiting for new material. 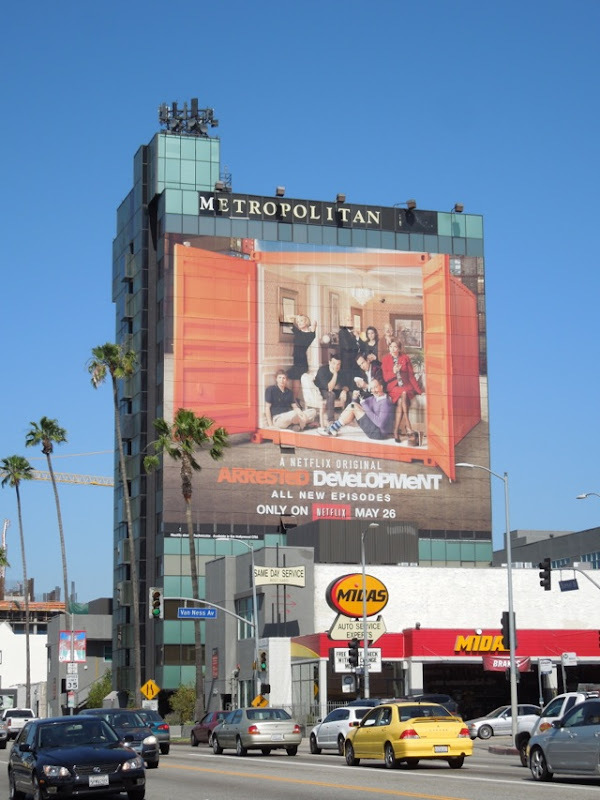 Bringing the dysfunctional Bluth family back is probably their smartest move to date and is sure to prove popular with the AD's devoted fans. 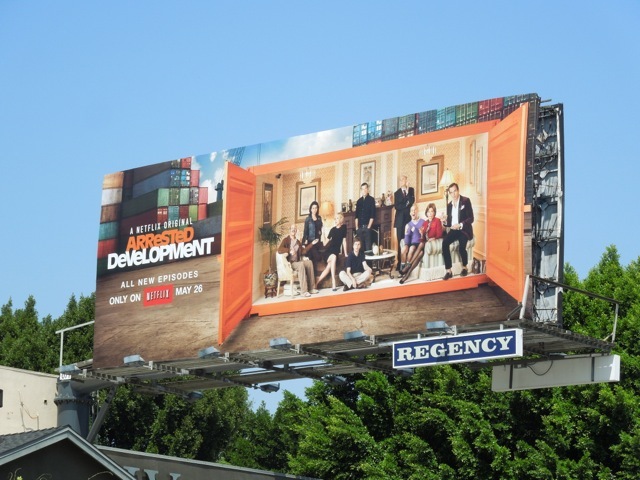 Get ready to enjoy the all-star comedy cast of Jason Bateman, Michael Cera, Will Arnett, Jessica Walter, Portai de Rossi, David Cross and guest-stars galore on May 26, 2013. 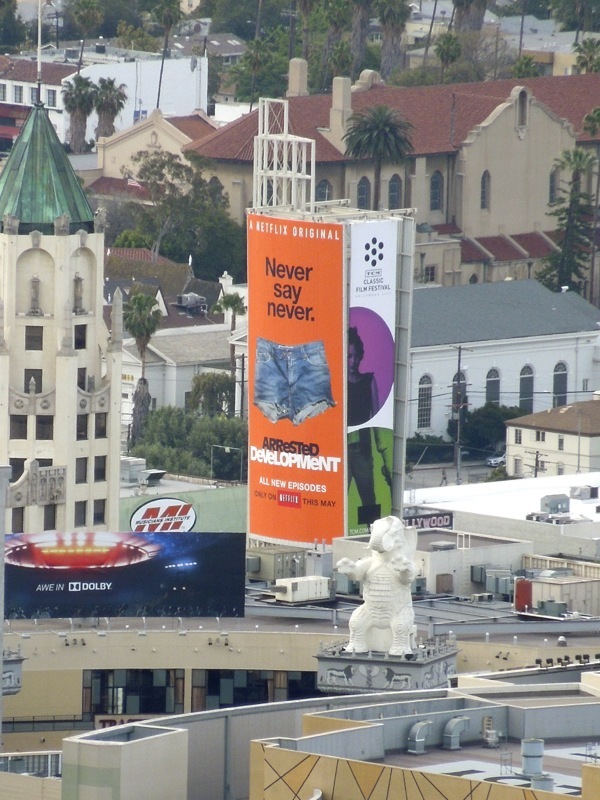 Arrested Development's season four denim cut-offs creative was spied high over Hollywood & Highland from Runyon Canyon on May 8, whilst the standard landscape billboard was snapped the next day along Sunset Boulevard. 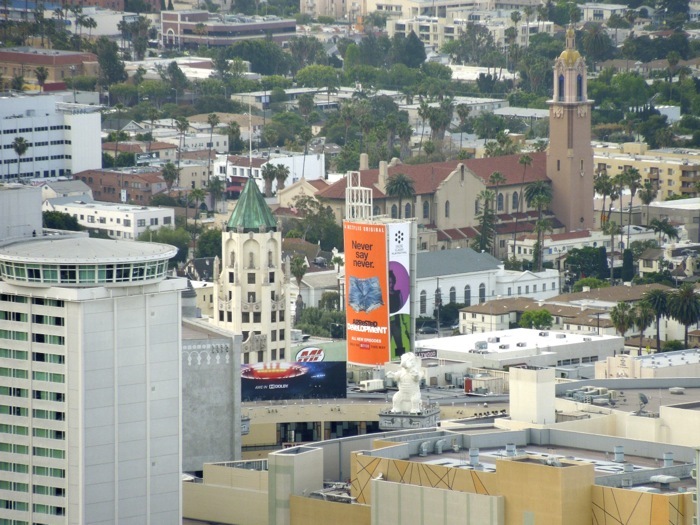 The giant-sized version for the returning sitcom was spotted further east along Sunset on the side of the Metropolitan Hotel Hollywood on May 14, 2013. 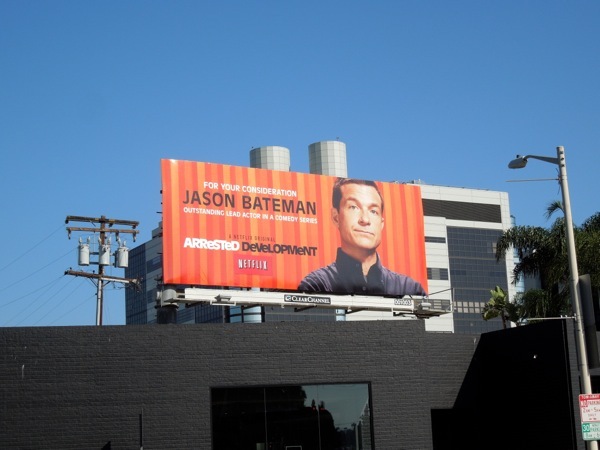 UPDATED: Obviously some people liked the returning fourth season of Arrested Development as Jason Bateman is up for an Emmy Award, for Outstanding Lead Actor in a Comedy Series for his portrayal of 'Michael Bluth', in the ceremony held on Sunday 22, 2013. 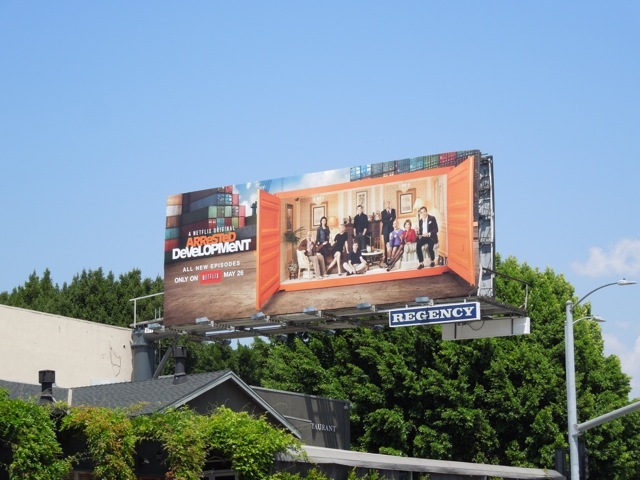 This Emmy nomination billboard for the Netflix series was spied at the intersection of Robertson Boulevard and Beverly Boulevard on September 18, 2013.